I never want to ride a motorbike. They are loud, scary, fire-spewing monsters growling impatiently at the rear-view mirror of those responsibly obeying the speed limit. Keep your massive engines and dapper jackets; I am quite comfortable with my two feet squarely on the ground, thank you very much. 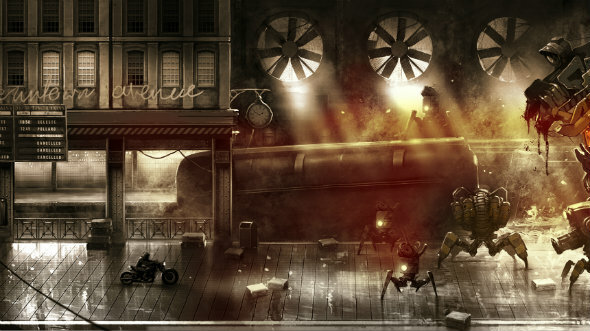 Steel Rats, a dieselpunk 2.5D stunt bike game from Tate Multimedia, is not about to change my mind. Spat out as one of four ragtag punk bikers, I, at first, thought I could immediately take charge of my new steed and tour my new home with ease. My first act as two-wheeled defender of Coastal City was to promptly lose my two wheels after confidently clambering on my snarling steed, probably leaving the hordes of invading robots chuckling, rather than quaking, in their bolts. Steel Rats brings the memories of learning to ride an actual bike flooding back. Once you fall, you either get up again, or give up – but it is well worth persisting. You might be tempted to blame the bike. But since Steel Rats comes from the developers behind Urban Trial Freestyle, you could be forced to admit that Steel Rats is merely firm, but fair. “From the beginning we said that Steel Rats was not going to be a casual game,” Tate PR and marketing manager Michal Azarewicz, says. “Even when I was playing it took me 40 minutes to even be any good.” And, with an army of robots to smash, mastering your motorbike is only the beginning. For starters, there is a 2.5D environment to contend with – Steel Rats is about exploration as much as it is getting from left to right. The extra half dimension helps me surround small bug-like robots, peppering them with gunfire. Breezing past a stairway to the murky depths of a metro station, I use my wheelsaw – blades with sharp teeth latched to my front wheel – to zoom vertically up the side of a building, Tron-like, granting me a striking view of an industrial, retro-futuristic landscape straight out of Blade Runner. Like patches on a leather jacket, the team at Tate have their influences stitched all over the game. 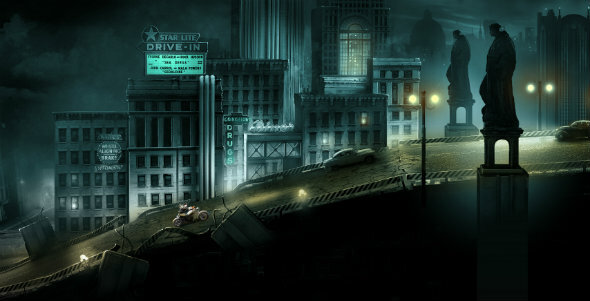 On the rooftop, there are tougher enemies to negotiate, which is where the game’s combat elements come in. 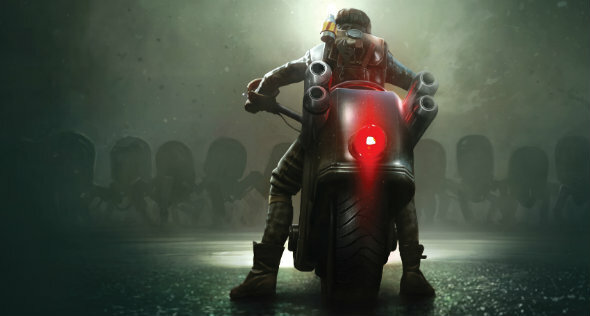 Each of the four playable characters come with different arsenals: one larger biker boasts higher damage, whereas others are nimbler but have lower health. Since I can still hardly ride the bike, taking on harder robotic foes means that I have to pass over to the QA lead, Pawel Oliferuk. Weaving between enemies and inventively using the world to best a large robot called The Spawner, it was a sight to behold. Blasting enemies away earns us war bonds, the currency needed to upgrade the bike. Currently there are eight separate parts of the bike that can be beefed up, keeping you in the fight against latter-game opponents. Rather than simply travelling from left to right, you will be tackling environmental puzzles, bashing bots, and flicking switches to access new zones: it is necessary for you to explore and engage in combat to improve your bike, RPG-style. You will want to explore, too: leaving scorch marks off the beaten track will help you learn the lay of the land and progress. If I did zip down to the metro station, I would have had moving trains coming either side of me, fully testing my shaky riding skills. I am also told that level design extends to tightly-packed arenas full of enemies to complex labyrinths, and more open levels. Steel Rats is still in pre-alpha – with Tate’s sights set on an early summer 2018 release – but it already looks ambitious when compared to stunt bike games like Trials. Gun targeting, admittedly, is a little iffy, but I am assured that this is firmly on the extensive ‘to polish’ list. Thinking on Pawel’s flamboyant rooftop theatrics, bike and gun bending to his will as he tears across a beautifully bleak world, I am keen to spend more time with Steel Rats and hone my skills. But, first, I need to get back up: I have fallen again.